This seems too astonishing to be true--but it is! The Midwest Conservative Journal calls our attention to an amazing address, in which PB Schori has extended reflections on ecology and its lessons for pastoral ministry. I must admit that the minutia the PB goes into in this speech makes it hard for me to take it seriously (i.e., the environmental impact of where our communion hosts come from or the geo-thermal drilling that apparently is planned for the GTS campus). But couple the lecture's general silliness in tone (e.g., consider this pearl of wisdom from her attack on Wall Street: "Sheep may grow fat on lush grazing, but too rich a diet can produce digestive upset and foul the pasture" ) with the blatant left-wing political bias of her argument and the address moves from ridiculous to detrimental. Take a look, for example, at her exhortation to pastors on the purpose of our sermons. I have always thought that our sermons are intended to proclaim forgiveness of sins through the cross of Christ and the promise of everlasting life in glory given through His empty tomb. But according to the Presiding Bishop I ought instead to be using them to equip my "parishioners to share the political labor, in the ministry of developing just and peaceful communities" (especially as the November vote approaches). Seriously, read through the speech and try to discern exactly what the PB thinks the "Good News" we should be proclaiming is. I find not a single word here that is not completely in line with the agenda of the secular Left in the Western world. PB Schori's vision of the Reign of God seems virtually indistinguishable from the party platforms of the Green parties of the industrialized West, as far as this address lays it out at any rate. Tending the soil is a great part of pastoral work. It is important to the whole of the flock and the whole ecosystem. The Western plains ecosystem was dominated by bison (buffalo) until fairly late in the 19th century. Those great grazers actually had a creative role in fostering the diversity and productivity of the plains. The bison were hunted almost to extinction for their hides, for sport, sometimes intentionally to deprive Native peoples of their livelihood, but also to make room for cattle and sheep. Competition between cattle and sheep herders, and lack of care for that great pasture led to great range wars in the Western U.S. in the 19th century. Because sheep will chew the grass down to the roots if you leave them too long on the same ground, the cattle ranchers who shared the open range often shot the sheep, and sometimes their keepers. Now, pastors in the church rarely shoot other species, but verbal violence sometimes accomplishes the same thing. We may tolerate or encourage attempts to remove species of Christians who seem excessively different. The irony of the range wars is that pasture land is most productive when it is intensely managed for the benefit of many species – either by free-ranging herds well-adapted to their ecological context, or by careful human intervention that moves the flock or the herd from one small pasture to another every few days. Those bison moved fairly freely across the plains, never staying too long in one place. Their mobility contributed to the health of the pasture, and to its diversity. The tall-grass prairie is one of the most diverse and productive ecosystems in North America. The very act of grazing encourages a flush of new growth in the grass, and if the animal doesn’t keep chewing on the same patch for too long, that productivity soon results in a greater harvest for the whole system. I don’t think it’s too great a stretch to think about how chewing (or ruminating) on a theological or spiritual issue at great length affects the health of the flock. The gatherings of Christians whose pastors build permanent high fences to keep the flock from exploring other pastures rarely thrive over the long term. Those communities who have enough freedom to wander over to another patch of grass, who don’t perseverate or obsess over three clumps of grass in one corner, have a greater chance to thrive. No species of grazer can stay healthy if kept on the same ground for long. The grasses suffer, and so do the sheep. And when animals are confined too long in one place, parasites thrive. RWF resumes: First, the irony of these remarks being uttered by a church leader who has herself tolerated and encouraged fierce attacks on "species of Christians" (i.e., the now gravely endangered species of orthodox Anglicans or "reasserters") who seem "excessively different" from her own revisionist mindset is simply too much to take. But more to the point, what precisely does the PB have in mind when she warns against allowing the sheep to "perseverate or obsess over three clumps of grass in one corner"? Have I been foolishly encouraging my flock to "perseverate" over clumps of grass like Niceno-Constantinopolitan Trinitarian doctrine, Chalcedonian Christology, and Scripturally-sound understandings of the Atonement? Perhaps they would have healthier theological digestive tracts if I encouraged them to graze on the lush pastures of Arianism, Adoptionism, and Scheiermacher for a while? Take a look around and see how well the Episcopal church has flourished on just such a doctrinally diversified diet for the last forty years! Please add this preposterous speech to the list as reason number 97 why I eagerly await the termination of my diocese's relationship to the General Convention of the Episcopal Church and its national officers, such as PB Schori. The Rt. Rev. Jack Leo Iker, bishop of Fort Worth, has written to our diocese with his ten reasons why it is time for us to terminate our relationship to the General Convention of the Episcopal Church and its leadership. The entire piece may be found on the diocesan website. 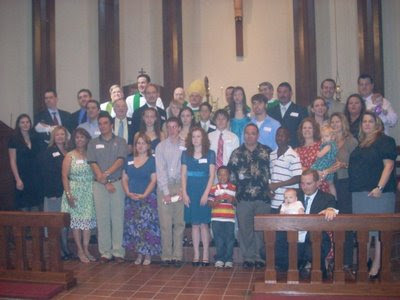 The "Mobilizing the Faithful - Toward A Faithful Future" conference will be held September 27, 2008 at St. Vincents Cathedral in Bedford, Texas. The conference will begin at 10:00 a.m. and conclude with lunch served around 1:00 p.m. The conference will feature morning prayer followed by education on the current issues surrounding the Anglican communion in North America, clarification on misinformation that has been spread to delegates and vestry members, and finally a call for Remain Faithful and all orthodox laity to urgently move forward with a new orthodox Anglican Province in North America in conjunction with Common Cause Partnership. The Standing Committee of the Diocese of Fort Worth rejects the deposition by the House of Bishops of The Episcopal Church of the Bishop of Pittsburgh, Robert William Duncan. The unconstitutional and illegal interpretations of the Presiding Bishop and the use of the canons in ways that were never intended deprived Bishop Duncan of a fair trial. 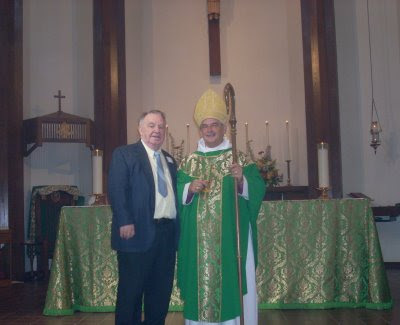 Bishop Duncan is a faithful servant of the Lord Jesus Christ. We rejoice in Bishop Duncan’s admission to the College of Bishops of the Southern Cone, and we reaffirm our commitment to work with him as a bishop in good standing in the Communion. Tonight St. Vincent's Cathedral hosted the third regional gathering of the Common Cause Partners in North Texas. The evening began with a service of Evensong in which the St. Vincent's choir sang their praises to God in their typically beautiful fashion. 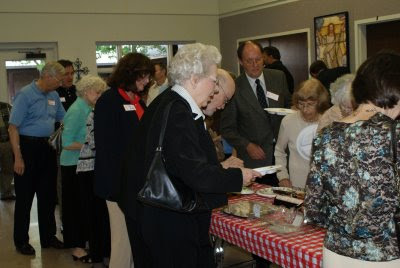 Then a well-attended potluck took place in the parish hall. Following dinner the Rt. Rev. Jack Leo Iker, bishop of Fort Worth, the Rt. Rev. Ray Sutton of the Reformed Episcopal Church, and the Rt. Rev. C. O. Kanu, Bishop Suffragan for the Convocation of Anglicans in North America (CANA) in Oklahoma offered their reflections on GAFCON, Lambeth and future of the Common Cause Partnership. Of particular interest was the news that the Presiding Bishop of the REC , the Most Rev. Leonard Riches, had recently told Bishop Sutton not to be surprised if the primates of the GAFCON movement recognize Common Cause as the orthodox Anglican province of North America as early as December. Bishop Iker pointed out that this recognition could take place after the next meeting of the CCP, which will in fact take place in December. Bishop Iker and Bishop Sutton both expressed the view that the new province will not replicate the traditional "territorial" organization of the TEC, nor will it have potentially "repressive" structures built into it. Instead it will most likely be organized by liturgical and cultural affinity. This was an exciting evening of prayer, news and fellowship. Thanks especially to Connie Sandlin for organizing it. Things are moving forward rapidly toward the new province! Thanks be to God! The picture above features (left to right) Bishop Sutton, Bishop Kanu, Bishop Iker, and the Very Rev. Ryan S. Reed of St. Vincent's Cathedral, Bedford. Thanks to my father, Randy Foster, for taking these photos. In spite of the sham deposition of Bishop Robert Duncan by the TEC House of Bishops, he remains the formidable leader of traditional Episcopalians and loyal Anglicans in North America. Both in his role as Moderator of the Anglican Communion Network and as the lead Bishop in the Common Cause Partnership, Bishop Duncan continues to have the respect of a majority of the Primates and bishops of the entire Anglican Communion, including the Archbishop of Canterbury. In an effort to silence him, this action has only given him greater credibility as the leader of the realignment movement. While I am sure that there are people on the theological Left who would love to console themselves with the thought that orthodox Anglicanism will die out over time and be replaced by more "enlightened attitudes," I have bad news for them today: we are growing like gangbusters at St. Vincent's Cathedral! Today we had a "standing room only" congregation for Bishop Iker's annual visitation. There were twenty confirmations and six baptisms. And don't forget the numerous transfers into the parish from elsewhere over the last few months. So friends, orthodox Anglicanism in North Texas ain't goin' away any time soon! The future is bright as we prepare to realign with the Southern Cone in November. One of the confirmands this morning was my eighty-two year old father, Randy Foster (below). May God bless all the newly-baptised and the newly-confirmed in their life in Christ. Amen. 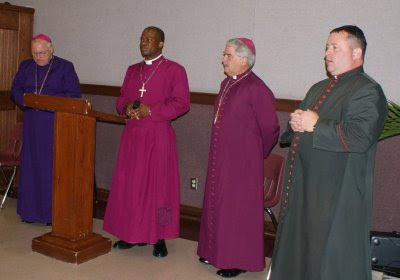 A resolution adopted by the 25th Annual Convention of the Episcopal Diocese of Fort Worth requested “that the Bishop and Standing Committee prepare a report for this diocese on the constitutional and canonical implications and means” of becoming a member diocese of the Anglican Province of the Southern Cone. Two preliminary reports* have been made – one on January 9, 2008, and another on February 12, 2008 – and both should be reviewed at this time, for they are an integral part of the recommendation we are making to the 26th Annual Diocesan Convention. After months of prayerful discernment and extensive consultation with others, both within our own diocese and beyond, we have come to the following conclusion. We recommend that this Diocese affiliate with the Anglican Province of the Southern Cone as a member diocese, on a temporary, pastoral basis, until such time as an orthodox Province of the Anglican Communion can be established in North America. We have been in conversation about this matter with the Committee on Constitution and Canons, and they will be presenting to Convention the necessary changes to our constitution and canons to enact this realignment. We pray for God’s grace to uphold and guide us in the days ahead and for the Holy Spirit to continue to inspire us “with the spirit of truth, unity and concord” as we seek to serve and glorify the Lord Jesus Christ. Responding to the "Steadfast Episcopalians"
It appears that virtually all members, lay and clerical, of the Episcopal diocese of Fort Worth received a letter in the mail from a group calling itself "Steadfast Episcopalians" during the last week. It seems the Steadfast Episcopalians, whomever they may be, have taken our addresses from old member directories of the parishes of the diocese, as mine was addressed to "Mr. Randall W. Foster" (n.b., the most recent directory from St. Vincent's was printed before I was ordained last year). The content of the letter was largely unobjectionable, indeed some of it was even laudable. This moderately conservative tone was clearly intended to make the Steadfast Episcopalians' goal of remaining within TEC seem reasonable to orthodox fence-sitters in our diocese who are still unsure about which way to turn during and after our upcoming November vote on disaffiliation from General Convention and the leadership at 815. It seems the letter's author or authors wanted to convey the idea that since there are plenty of "orthodox" Episcopalians left in our diocese the leftward drift of the national TEC over the last few decades shouldn't trouble us enough to make us want to bolt for another province. "Jesus wants us all to be one. Besides, since things are more or less OK around here locally in Fort Worth why should we risk taking any decisive action that might get us into trouble?," they seems to be saying. The Very Rev. Ryan S. Reed, dean of St. Vincent's Cathedral here, has written a crystal clear response to the Steadfast Episcopalians' letter. I commend it for your reading. The third Common Cause Partners-North Texas gathering for North Texas is scheduled for Sunday, September 21 beginning at 5:00 p.m. at St. Vincent’s Cathedral in Bedford, Texas. --the Right Reverend Nathan C. O. Kanu, Bishop Suffragan for the Convocation of Anglicans in North America (CANA) and founding vicar at Christ’s Ambassadors Anglican Church (Oklahoma City OK). The bishops will offer their reflections and guidance on GAFCON, the Lambeth Conference, and the future of Anglicanism, followed by a Q&A session. This will be an excellent opportunity for North Texas Anglicans and Episcopalians to hear directly from our faithful bishops about these important events, without being first filtered through various media. These discussions will also set the stage for other upcoming decisions and events in the coming months. Participants are invited to bring potluck dishes to share.. To pre-register for child care (number and ages of children), please call the cathedral office at 817-354-7911 by September 14, 2008. St. Vincent’s Cathedral is located at 1300 Forest Ridge Drive Bedford, TX 76022. We are located three blocks south of Airport Freeway (TX Hwy 183/121) on the corner of Forest Ridge and Schumac Drive. Look for our 96 foot campanile! For any additional updates about this event that may be needed, please see the CCP-NTX message board at http://ccpntx.forumco.com./ Registration required. The image above is the official logo of GenCon09. It represents a Zulu word, ubuntu, "a Zulu or Xhosa word that describes humaneness, caring, sharing, and being in harmony with all of creation," according to Episcopal Life. It seems that it represents a group of people dancing, reminiscent of the collective post-communion exertions undertaken at the legendarily left-wing St. Gregory of Nyssa parish in San Francisco. It is my sincere hope that no delegate from my diocese will be there to be ubuntu-ed next summer.